I’ll admit that zippers scare me. The thought of having to put them in an item I’m sewing makes me sweat a little and even contemplate changing the design to avoid it (I’ve done a handful or so, I just hate doing them). There are a couple of projects I want to do for the kids for Christmas and I think I really need to just get over my fear and tackle it head on. Ashley over at make it and love it posted a great tutorial last week about installing zippers. Maybe using her method would help ease my fears. If your house is anything like ours, after each child we seem to have a plethora of receiving blankets stuffed in drawers and closets. We love them for the itty-bitty stage when you can lay baby on a blanket on the floor and the baby actually stays ON the blanket. They’re easy to wash if baby spits up and will help preserve more cherished blankets. But as baby grows and becomes mobile, those same blankets that were so well used at one point sit untouched. I hate tossing anything that is still functional, (especially when it’s good usable fabric!) but in a crowded house I need all the space I can get. So instead, I came up with a great way to re-purpose them into something functional! 1. Gather the receiving blankets you want to use. I’ve found there are two sizes — the small ones aren’t big enough to cover one side of my changing pad so I have to use the larger ones. I think the large ones are about 40″ x 30″. You can use either the flannel or the cotton and if you’re lucky you’ll have 2 of the same pattern so both sides match. If your receiving blankets aren’t big enough to cover one side of your changing pad you can always sew them together in a patchwork sort of fashion to get fabric pieces large enough. 2. Measure the changing pad. You’ll need all three dimensions — length, width and height. If you have a contoured changing pad (where the sides are higher than the center) make sure to measure at the highest point. 3. Calculate the size of the fabric pieces to cut. Since my fabric wasn’t big enough to cut a single piece, I had to cut 2 (one for each side) and sew them together. To determine the width of the fabric add the width and the height together, adding an extra 1″ for seam allowance. To determine the length of the fabric add the length and the height together, adding an extra 1″ for the seam allowance. The 4th photo shows how to calculate the dimensions for a single piece. If you have a contoured changing pad, add an extra 1″ or so to the width to account for the uneven surface. 4. Cut your fabric piece(s). 5. Right sides of fabric facing, sew along 3 of the sides. When you’re finished it will look like a pillowcase. I used my serger to keep the raw edges from fraying. If you don’t have a serger you can use a zigzag stitch instead. 6. Sew along the the open edge to keep it from fraying. 7. Fold the edge down 1/2″ toward the wrong side of the fabric and iron. 8. Reach inside, grab the bottom seam and pull, turning right side out. 9. Topstitch 1/4″ from the edge of the opening. This will sew that edge down that you folded under. If you don’t want to finish the edge you could just fold the raw edge under twice and then topstitch instead. 10. Slip the finished cover over your changing pad. 11. (Optional) Add Velcro, snaps or buttons to close the opening. I left it just the way it was for quicker removal in messy situations. This project has been approved and endorsed by the small one in the Stitch To Stitch household. If you’re not taking photos to write a tutorial, you should be able to complete this project in under 30 minutes. Easily. Maybe even 15 if you’re not distracted by small children, your cell phone or Facebook. If you’re like me, you’re starting to draw together ideas for Christmas gifts. Maybe you’re making big projects for those you love; maybe your budget is tight and you can only make small items; maybe you just want some smaller projects to fill in the gaps or have on hand for people that drop off unexpected cookie plates. No matter the case I thought it would be fun to start posting some cute ideas for holiday gifts. I’m a sucker for a good old-fashioned neck/muscle warmer. The kind that is filled with some sort of small grain and zapped in the microwave to warm up slightly. To me, a heating pad just doesn’t cut it. It never seems to contour well to whatever body part I’m babying and I’m always getting wrapped up in a cord. Plus, it’s nice to not have to worry about turning something off that’s plugged into the wall and typicall sandwiched between me and layers upon layers of combustible materials (pillows, sheets, blankets, mattress, etc.). A while back I started making these rice neck warmers for friends. For a small amount of money you could easily whip up one within a short amount of time. 4 cups of rice, wheat or flax seed. I’d post some pictures of the ones I’ve made, but it seems as though I have NO photos of all the ones I’ve made and given away. Hmmm. I guess I need to get better about photographing the projects I finish before wrapping them up in pretty paper. I’m a huge fan of the website Sew, Mama, Sew! The tutorials she has posted are creative and the instructions are easy to follow. 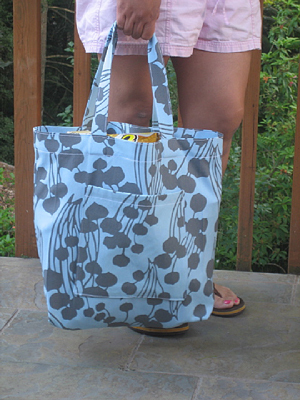 When I was looking through the website the other day I came across a tutorial for a classic tote bag. I’m thinking this would make a great gift for my home care nurse. She’s mentioned more than once how “drab” her supply bag is but how she never thinks to look for a new one. Over the last 15 weeks she’s come to be so much more than my nurse, but a friend as well. I’d love to be able to make one of these for her. We’re at the point around here where she whom I have affectionately termed, “baby girl” no longer needs or wants to sit in a booster seat at the table. At almost 4 years old, and far from a baby, she’s big enough to sit by herself but once in a while it would be nice if she had a little extra height underneath her to minimize the mess at dinner. Phone books are no longer the option there were to us 25+ years ago and sitting on her knees results in tingly feet after a few minutes. 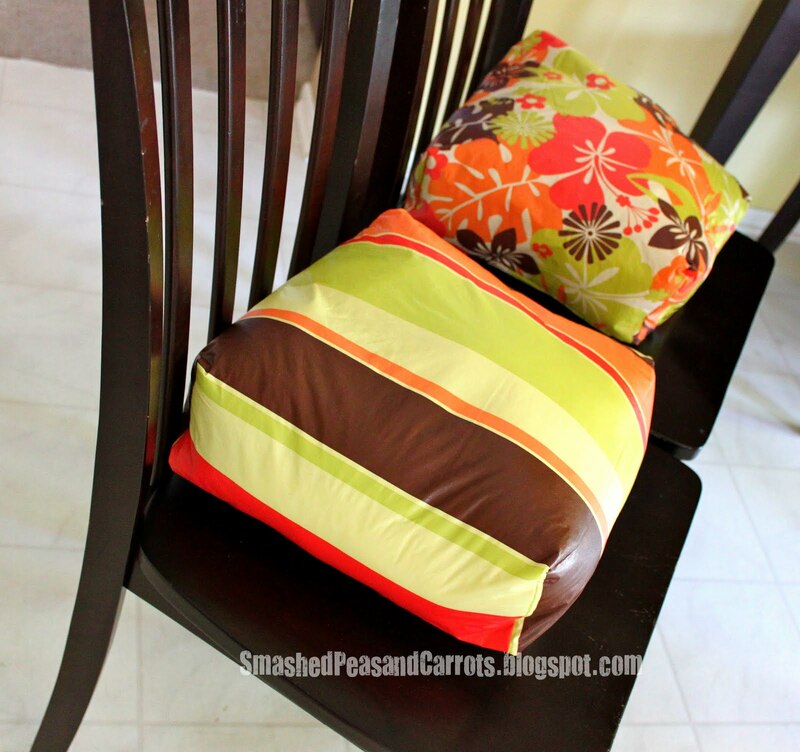 So I was super excited when I saw a tutorial over at Smashed Peas and Carrots for booster seat cushions using vinyl tablecloths as the out fabric! What an incredible and ingenious idea! I’m always on the lookout for great sewing blogs (my blog reader has over 50 of them that I follow! ); especially great blogs that pass on awesome sewing tutorials. I stumbled across an absolutely adorable tutorial this morning for a baby sleep sack made using upcycled dress shirts for the material. With the new baby on the way I quickly bookmarked it for future use and mentally thumbed my way through hubby’s closet, wondering if he’d *really* miss a shirt or two here and there. It also gave me the idea of creating a weekly blog post where I share some of the great patterns I’ve found. Some of this stuff is just too great to keep to myself!